I've wanted one of these ever since I saw the advertisements in the back of Modern Photography. A lot of inexpensive photo meters are largely just the same; this one is unique. I've never seen another one like it. 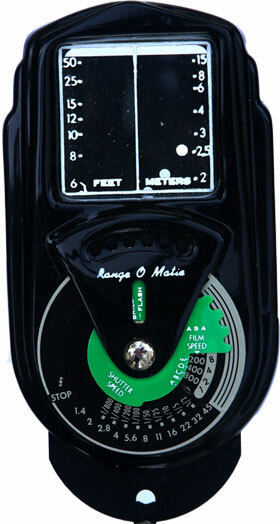 This is a combination range-finder and exposure calculator. At the time it was made, only expensive, professional cameras had built-in rangefinders and none had meters. This was a gadget which promised to do both for very little money. It's really quite a rig. I was fortunate enough to get the instructions because you'd never figure it out on your own (click on the PDF icon above to get to the documents page). But here are the basics: for rangefinding, you hold this thing 13 1/2 inches away from your eye (you can set the neck-strap so that it places the meter at the proper distance), then frame your subject's face in the window. There's a pull-down slide, so you frame the face between the model's hairline and chin--then you can read the distance. For non-human subjects you need to use a special target (or anything that's the proper length). For metering, there's an arc of dots, each with a progressively darker neutral density filter. The slide has holes, so that as you pull the slide down, a dot would let light through. So you aim this at your subject and adjust the slide until you see which dot is just barely visible. Then you read the ƒ/stop in the window above (the slide will be on it). There's also a flash calculator, which is a logical extension of knowing the distance. Flash exposure is determined by distance, film speed and which flash bulb you're using. Since this thing tells you the distance, you look up the bulb value form a table on the back of it, then you can calculate exposure with the dial in front. I'm not saying all this worked very accurately, but it's extremely clever. 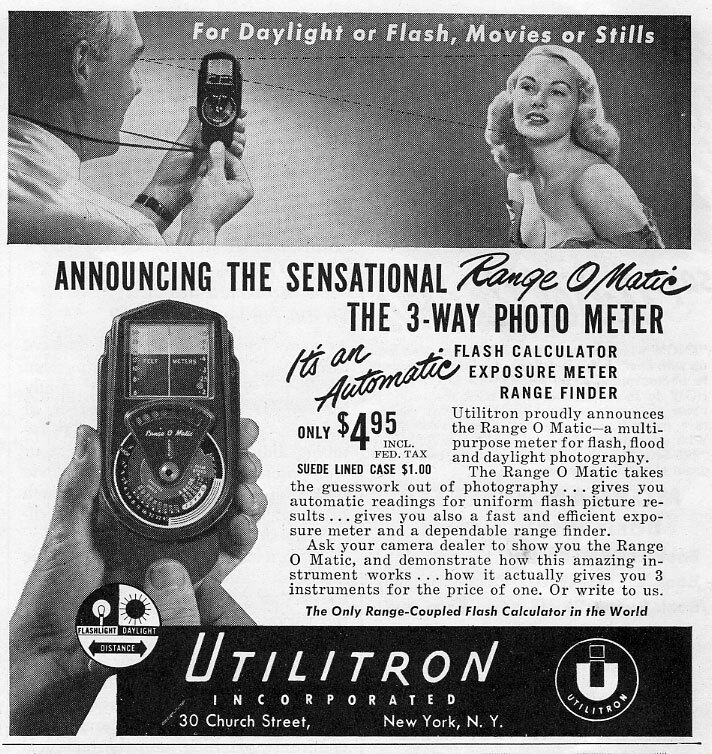 The ad here, and all the ones I've seen, are from a company called Utilitron, yet my Range-o-Matic is identical but it's branded Pelco (short for Product Engineering Laboratories). 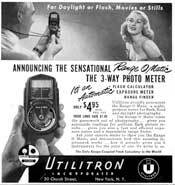 I don't which came first, but I believe they're the same company, just with a name change; but Utilitron may have been a distributor. I haven't been able to find anything useful about either company, and I haven't been able to ferret out a patent for this thing either. That surprises me. This is one of the few meters of this era which is still worth money. The very few occasions I've seen them on eBay they've been fetching around $75 - $100 each. Considering that's it's an inexpensive gadget, not an actual electro-mechanical meter, that's very unusual. Compare that to my Amerline or a Leudi, which are about the same age—both of those meters are worth about $5-$10 each on a good day.